You are here: Home 2009 December Bravo Sen. Grassley! 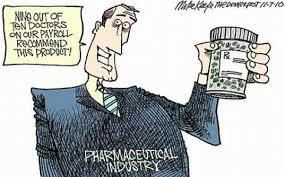 Shining more light on Big Pharma. Dr. Weeks’ Comment: More than 25 years ago, when I first got busy holding empowerment workshops where we taught patients to taper off medications by nourishing themselves and correcting their own imbalances through diet and lifestyle changes so as to re-attain health, I was always amazed and dismayed to hear from various patients that, when they brought the secret of their new health back to their various support groups – be it MS or arthritis, or heart rehab groups – that the leaders of those allegedly “self-help” groups told them to shut up! When my patients refused to shut up and insisted on sharing the reasons for their success, be it bee venom for MS and arthritis, raw honey for acne or dermatitis, EDTA chelation for heart disease and heavy metal toxicity, what happened was that they were told to leave. That the self-help group didn’t want to hear about their non-standard experimental process. Broken hearted or pissed off (depending upon the temperament of the patient) they left and never looked back. In the essay which follows, we learn why – as always: follow the money. We read that all too often, allegedly independent self-help groups are funded by and therefore ultimately serve as marketing arms of Big Pharma. When this economic relationship is hidden, it violates the public trust to the point of criminal behavior. These are help prifits for Big Pharma much more than they are “self-help” groups aiding patients. Tonight, my daughter Fiona and I read Emerson’s wonderful essay “Self-Reliance” with all its sublime wisdom and I reflected upon its relevance for empowered patients. Empowerment: may you and I all attain more of this in the year ahead! Senator Grassley has asked TeenScreen and 32 other groups for information about the financial backing they get pharmaceutical companies. WASHINGTON — Senator Grassley has asked 33 medical groups for information about the financial backing they get from the pharmaceutical, medical device and insurance industries. “These organizations have a lot of influence over public policy, and people rely on their leadership. There’s a strong case for disclosure and the accountability that results,” Grassley said. Grassley said his inquiry follows a review of industry support for the National Alliance on Mental Illness, where he questioned the organization’s national office and state chapters. The Alliance subsequently adopted a new policy of publicly releasing industry support over $5,000. “It’d be good for the system if other organizations would follow NAMI’s lead in this area,” Grassley said. For several years, Grassley has conducted extensive oversight and sought disclosure of financial ties with industry from research physicians, medical schools, medical journals, continuing medical education, and the patient advocacy community. He has worked to expose cases where there was vast disparity between drug-company payments received and reported by leading medical researchers. In response to Grassley’s work, the National Institutes of Health is working on new disclosure guidelines for federal grant recipients. Grassley is also working for congressional passage of reform legislation he has sponsored with Senator Herb Kohl. Their bipartisan Physician Payments Sunshine Act would require annual public reporting by drug, device and biologic manufacturers of payments made to physicians nationwide. “I’m interested in transparency,” Grassley said. “Letting the sun shine in and making information public is basic to building people’s confidence in medical research, education and the practice of medicine,” Grassley said. This week, the senator’s letters of inquiry were sent to the American Academy of Orthopaedic Surgeons, the Alzheimer’s Association, the American Academy of Allergy Asthma and Immunology, the American Academy of Dermatology, the American Academy of Family Physicians, the American College of Obstetricians and Gynecologists, the American College of Surgeons, the American Dental Association, the American Diabetes Association, the American Dietetic Association, the American Heart Association, the American Hospital Association Inc., the American Medical Association, the American Psychological Association, the American Society of Anesthesiologists, the American Society of Colon and Rectal Surgeons, the American Society of Consultant Pharmacists, the American Society of Health-System Pharmacists, the American Society of Hypertension, Inc., the American Society of Nephrology, the American Society of Plastic Surgeons, Children and Adults with Attention Deficit/Hyperactivity Disorder, Depression and Bipolar Support Alliance, the Heart Rhythm Society, Mental Health America, NARSAD, the National Association of Chain Drug Stores, the National Organization for Rare Disorders, the North American Spine Society, Screening for Mental Health Inc., the National Center for Mental Checkups at Columbia University (TeenScreen), The Leukemia and Lymphoma Society, and the American Cancer Society. Filed in: Medical Economics, Quis custodiet ipsos custodes?